Universities are increasingly finding a strong correlation between students living on campus and increased academic success. While many factors contribute to these connections, the outcomes are significant enough to lead some universities to rethink their strategies for housing students. Many institutions are looking for opportunities to provide new and alternative living situations for their students. Others are implementing policies encouraging or requiring certain students to live on campus. 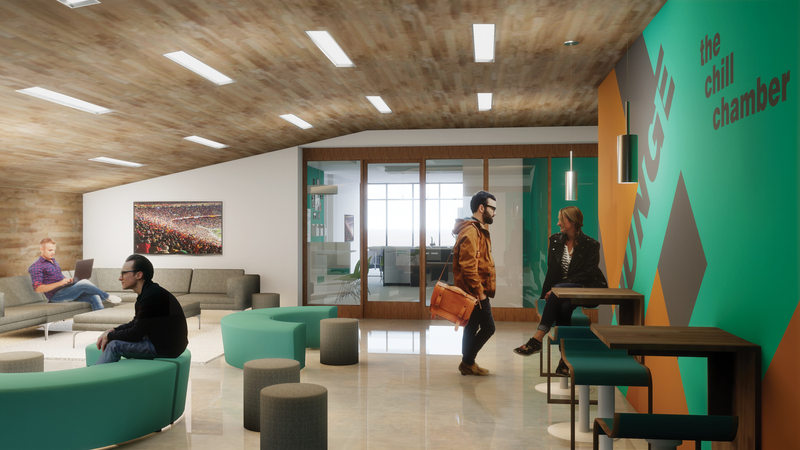 How can student housing design promote the success of college students? Larger spaces can be used as lecture halls, studio spaces, and workshops, while smaller spaces are used for community kitchens, workout spaces, and study rooms. Traditional and unique fitness options are located on each floor. Pool tables, ping pong, and video games help students to unwind. Meeting and study tables activate laundry areas. Shared cooking and dining areas create social connections. Rows of built-in desks terrace between two floors to create an area for lecture learning. Larger double-height spaces can be used for classroom and studio spaces. Smaller spaces can be closed off for more specific uses. Centrally located spaces are enclosed for wood or metal working. Units line the edges of the Studio House building with a variety of classroom, study, activity, and lounge spaces between. The interstitial spaces can be combined vertically to allow for double-height spaces. The communication wall helps roommates stay in contact. A variety of seating options are provided to serve all 8 roommates. Each of the four bedrooms houses two roommates. Two roommates share a connected bathroom.